“The King of the Savoy” reigned supreme over jazz drummers in New York in the 1930’s. He was the consummate showman and with his fluid and rhythmic style, was perfectly suited for the swing era. He raised the standard for drummer awareness, and paved the way for drummer led bands. Born in Baltimore, Feb. 10, 1909, William Henry Webb, was an unlikely candidate to become a jazz drummer. Stricken with spinal tuberculosis, he was left with a hunched back, and little use of his legs. He took up drumming as a way to relieve joint stiffness, and never stopped. He saved enough to buy a drum set which he had fit with special pedals for his legs. He joined local band the Jazzola Orchestra, then in 1925 decided to try New York City. He sat in on sessions with Johnny Hodges, Benny Carter, and Duke Ellington, after settling in by 1926 he had his own quintet, and played for five months at the Black Bottom Club. He formed an eight piece band, playing the Paddock Club, moving next to the Savoy with his now called Harlem Stompers, and setting up there in 1927. This band grew to eleven members, and by the end of the ‘20’s they were gigging at all the major jazz clubs in the city as the Cotton Club, the Roseland, and the Strand Roof. In 1930 they toured with the “Hot Chocolate Revue”. By 1931 the band was on an extended engagement contract at the Savoy, which would last for the next five years. They also did road tours and other dates at clubs such as the Casino de Paris, but it was the Savoy where they would get a name. Chick Webb had himself become quite a star, known for his power drumming and showmanship, he decided to name the band the Chick Webb Orchestra. The lineup at the time included Benny Carter, Louis Jordan, Don Redman, and Mario Bauza. This band was actually feared in the Harlem club circles, as they were known to blow any other band off the stage. There are many stories about the long line of musicians that left the Savoy with their tails dragging in the ground after being ‘cut’ by Chick Webb. 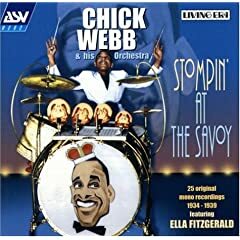 Their theme song and the one that is associated with the Chick Webb Orchestra, was “Stomping at the Savoy”. Which is what they did best, flat out swingin’ man! The band was to enjoy a long run at the Savoy then when things couldn’t seem to get better, he replaced his longtime vocalist with a young Ella Fitzgerald in 1935. The band had a string of hits on the Decca label that was capped off by their biggest ever when Ella wrote “A Tisket A Tasket” in 1938. By 1938 Chick’s health started to take its toll but he continued with the band through that year. In June of 1939 he entered John Hopkins Hospital in Baltimore for a major operation, he never recovered; his mother was at his side when he died. Ella Fitzgerald went on to front the band until 1942. All About Jazz musician pages are maintained by musicians, publicists and trusted members like you. Interested? Tell us why you would like to improve the Chick Webb musician page.